Your brakes are crucial to the overall operation and safety of your vehicle. Without properly working brakes or an Anti-lock Braking System, we believe you and your passengers could be in grave danger. Jack’s Auto Service is here to help. Since the 1980s, we have been providing auto repair and service to vehicle owners throughout the Grand Rapids area. Our technicians are extremely qualified and skilled in regards to brake and ABS repair. We have performed countless hours of service and repair to brakes and traction control systems. If there is a problem with your brakes, we try our best to repair the issue as soon as possible. 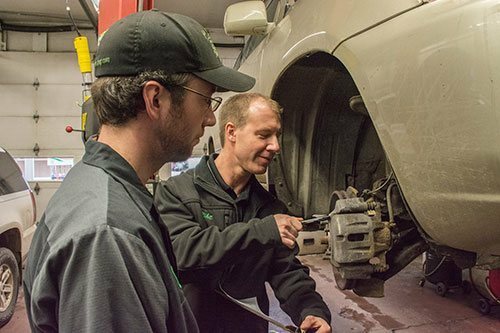 Our ASE certified technicians are experienced and educated on braking technology. We use only the highest-quality tools and equipment to service and repair your car’s brakes and traction control. If your personal automobile or fleet is in need of ABS maintenance or brake repair, we invite you to Jack’s Auto Service. You can trust our friendly and experienced staff to get your car, truck, minivan or SUV driving its best!